Waterford will now take on Limerick next weekend. 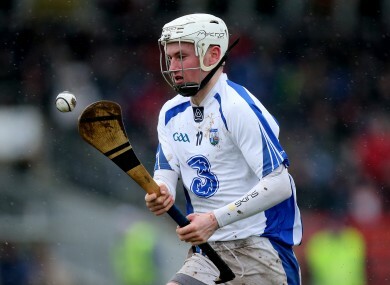 Brian O'Halloran (file photo) hit 1-4 for the Waterford hurlers today. BRIAN O’HALLORAN REGISTERED 1-4 as Waterford battled to victory against a stubborn Limerick IT at a dull Carriganore in this afternoon’s Waterford Crystal Cup first round tie. His strike ten minutes into the second half offered the home side breathing space to progress to a quarter final meeting away to Limerick next weekend. Pauric Mahony helped out O’Halloran in attack with ten points while ten different sources contributed on the scoreboard. Gavin O’Brien, Austin Gleeson and Pa Walsh also formed a steady half-back line. Derek McGrath offered competitive debuts to Pa Walsh and Michael Kearney and the hosts started brightly. They opened up a four gap before LIT’s defence got to grips and they implemented their short passing game. Four frees from David Reidy and two from play by Seanie O’Brien levelled the contest at nine points all on 31 minutes. Pauric Mahony scored six points for the Deise in that first half (five frees) and they departed with a 0-11 to 0-9 lead at half time. A Mahony double stretched that advantage to four on the restart but Davy Fitzgerald’s side maintained their interest. Paul Flaherty, Alan Dempsey, Reidy and O’Brien raided points for the plucky students to tie it up again (14 points apiece). Michael Walsh and Pa Walsh retrieved Waterford’s lead before O’Halloran smashed home from close range after 45 minutes (1-16 to 0-14). Great to see @brianoh91 back in a Waterford jersey today and showing how good a player he is,here's hoping he has an injury free year. LIT reduced the damage to a goal entering the last seven minutes but Waterford shut down the game with O’Halloran as destroyer in chief. The Clashmore man accounted for 1-3 during a busy second half. Substitutes Donie Breathnach and Shane Bennett sealed the win with late singles. Scorers for Waterford: Pauric Mahony 0-10 (0-8f), Brian O’Halloran 1-4, Gavin O’Brien, Pa Walsh, Martin O’Neill, Shane O’Sullivan, Kevin Moran, Michael Walsh, Shane Bennett, Donie Breathnach 0-1 each. Scorers for Limerick IT: David Reidy 0-9 (0-8f), Seanie O’Brien 0-3, Paul Flaherty 0-2, Alan Dempsey, David Dempsey, Patrick Fitzgerald, Barry O’Connell 0-1 each. T Waring for Mahony (71). Email “O'Halloran stars as Waterford hurlers defeat Limerick IT in Waterford Crystal Cup”. Feedback on “O'Halloran stars as Waterford hurlers defeat Limerick IT in Waterford Crystal Cup”.